In my opinion, a meal should get better as it progresses. I would never put all my energy into an exotic and complicated starter, and then follow it with spaghetti and jello (okay, I would never follow anything with jello, but that’s beside the point). A simple meal is fine, and especially when I have perfect, top-quality ingredients, I love to leave things as unfussy as possible and prepare things like soup or salad, roast meat and vegetables, and fruit, and leave the flavors of the food to speak for themselves. That said, sometimes I crave something a little bit different, and I love finding recipes that combine flavors and textures in unusual and unexpected ways. I love the sensation of eating something for the first time and having my tastebuds sing out "wow!". And of course, if I prepare something a little bit exotic as part of a multi-course meal, it has to be matched, if not outdone, by everything that follows. Following recipes from books can sometimes be a hit-and-miss affair, and long-established kitchen wisdom dictates that you should never try out new recipes on unsuspecting guests. Phooey, I say! I use my guests as guinea pigs all the time; the thing I normally worry about is not whether the food will be good (since I brazenly figure I can fix most bad recipes before they hit the table), but rather if it will be as good as what came before it. For Saturday’s dinner there was the added pressure (self-imposed) of no longer falling in the ranks of normal people, but instead of Food Bloggers. This is completely ridiculous, I know. But when you’re putting your thoughts on food out there for all the world to see, you don’t want anyone discovering that you can’t even stumble your way around a kitchen! Well, I can happily say that the recipes I selected for Saturday’s meal all came up to bat for me and hit home runs. Each dish was slightly more interesting and unexpected than the one before, and they all built upon each other’s strengths to create one truly memorable meal, and at least for the moment, my membership in the food blogging brotherhood (sisterhood? personhood?) is still intact. Recipe Source: the marinade came courtesy of the Moro cookbook, and the sauce came from the aforementioned Crazy Water, Pickled Lemons with a few detours. Mix together all the marinade ingredients and rub over the poussins. Leave them in the fridge to marinate for at least a couple of hours. For the sauce, soak the saffron in 1/4 cup hot water. Melt the butter in a heavy-bottomed pan over medium heat and add the onions. Cook slowly, stirring often, until the onions begin to caramelize and melt together, about 15 minutes. Add the garlic, cinnamon, ginger and black pepper, and fry for another minute. Add the tomatoes, and fry until they start to break up, about 5 minutes. At this point add the stock and saffron, and let simmer until the mixture reduces by about a third, about 20 more minutes. At this point I pureed the mixture, but you don’t have to. Add the honey (the amount should depend on how sweet you want it to be – I added the full amount to get it really jammy), lemon juice and flower water, if using. Let it continue to cook until it gets to the consistency you want – it should be quite thick – and do a final taste for sweet and salty. At this point you can leave it until you’re ready to serve, just reheating at the last minute. For the poussins, preheat the oven to 375F/190C. Put the birds breast-side down in a roasting pan and roast in the oven until golden on top, about 25 minutes. Flip them over and continue roasting breast-side up for another 15-20 minutes, until well browned on the breast and juices run clear. 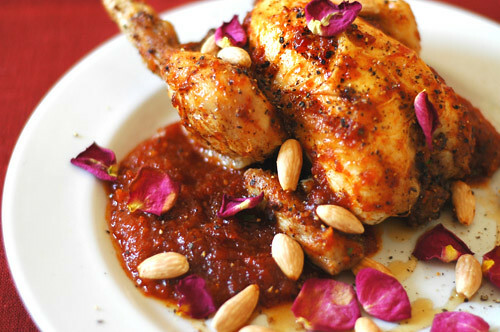 Serve the poussins on a pool of the jam, sprinkle with the almonds, chopped coriander and rose petals, if using. Note: Poussins are a great ‘company’ thing, since everyone gets their own little bird, and here in the UK they’re quite easy to find. The original recipe for this dish actually calls for plain old chicken, and has you brown the chicken pieces and then add them to the sauce at the same time as the stock. I might try it that way in the future, but I found the contrast between crispy roasted bird and sweet jammy sauce to be really delicious. Either way, though, it will be magnificent. beautiful! I am absolutely going to make this recipe this weekend. I am once again stunned by your recipes choices and your photography.. Your guests are very lucky! As one of the aforementioned guests I can attest to my good fortune! Thanks again for an incredible meal, Melissa. I won’t be forgetting it in a hurry. I really want to try out some of the recipes myself but I doubt I could live up to your high standards! Hi Melissa,Just wanted to let you know that I made the chicken recipe yesterday and it was unbelievable. The aroma that filled my kitchen was so wonderful! And it was actually quite easy, considering the chicken is marinated in advance and the jam can also be made ahead of time. The whole thing was a combination of flavours that I’d never really cooked with before–and now I’m totally hooked. Thanks again for sharing it with us! Fantastic! I’m so glad it worked out for you. Did you manage to get your hands on the cookbook? Hi Sarah – That’s really interesting, I figured my interpretation of this dish took it so far from authenticity that it would have no resemblance to any real Moroccan food. Thanks for your compliments – there are certainly a lot of beautiful photos this time! when i first read this post, i filed it away knowing there would be a perfect opportunity to use it. that perfect opportunity came about tonight and i’m very happy and thankful to tell you it was a success. i made a special belated valetentine’s day dinner for my boyfriend and prepared this as the main dish. it was absolutely delicious although your food will always look better than mine. *smile* how did you get your sauce such a deep red? mine was more orange.. it actually looked like it was made of carrots.. great site, love the writing and your food. Hi Anne – I’m delighted to hear this turned out well for you! I suppose the color has something to do with the tomatoes (did you use fresh or canned? ), but if it tasted good, that’s all that matters! Hi Anne – Sounds good to me. Why not give it a try and let me know how you like it? Hi Saran – If you want to stick with a Moroccan theme, couscous would be a good bet, otherwise I would probably do rice (perhaps a spiced pilaf?). For vegetable sides I would probably do either a couple of cold vegetable salads or something roasted (maybe zucchini or asparagus?). Hope this has given you some ideas – good luck and let me know how you like it! My cornish hens are about to go in the oven. Everything is so fragrant and I am getting extremely hungry! This meal is quite easy and I have this feeling that it will become a hosuehold favorite. P.s. i found this website on stumble upon and I noticed that no one's commented since 2006. I'm obsessed!